June is LGBT Pride Month. A time to reflect on past (and current) struggles, celebrate positive changes and paint the town rainbow. 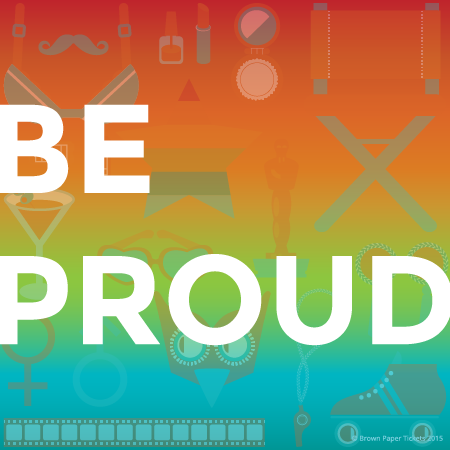 In honor of Pride Month, here are 13 LGBT festivals, parades, parties and fundraisers in big cities and small towns around the U.S. Do whatever makes you feel most proud. 1. The Story of Gay Pride in Drag, Seattle. Sylvia hopes to start a new tradition with gay “herstory” pageants. She pays homage to pride’s progression through drag and explores how drag queens and fringe performers have helped move LGBT rights forward. 2. German Beer Sparkle Party & Cabaret Show, Philadelphia. This cabaret show caught our eyes because it converges two things we like—Philly Beer Week and Pride Month. Sip German stouts and watch a dazzling drag performance by Martha Graham Cracker and her cabaret band. 3. A Little Rainbow in the River City, Austin. Did you know Austin and San Antonio share the nickname, River City? Austin’s Capital City Men’s Chorus joins the Live Oak Singers, a San Antonio-based LGBT chorus for inspirational music selected from the great American Songbook. 4. The Stonewall Chorale Goes to the Movies, New York City. Strut the red carpet in your finest. Sing along to classic movie tunes, like “Over the Rainbow,” and “Moon River” with the nation’s first LGBT chorus. This event doubles as a fundraiser so you’ll get to bid on must-have items in the lobby. 5. Artemis Singers Present … Proud to be Me, Chicago. Celebrate pride with a song. Artemis Singers, Chicago’s Lesbian Feminist Chorus comprises, “women with diverse backgrounds who are dedicated to performing music written or arranged by women.” Artemis Singers is still singing it loud and proud after 35 years—that’s incredible. 6. Gem City Rollergirl’s Pride Bout, Dayton, Ohio. Frothy beer, free parking and loads of jamming fun for all. 7. Dentistry Pride Alliance Fundraiser, Chicago. Finally, a dentist you’ll want to see. The Dentistry Pride Alliance fundraiser mixes socializing, cocktails and performances by dental students. Raises money for the College of Dentistry Pride Alliance’s efforts to improve LGBTQ oral health in Chicago. 8. Elko Pride Festival, Nevada. Whether you’re tying the knot or just want to celebrate love, this festival sounds like the place to do it. Local bands, guided tours of waterfalls and local wedding planners will renew vows or assist couples ready to take the plunge. Be a part of history as the first Pride Festival Parade marches in downtown Elko. 9. Lush Party, Boston. Count it up: three DJs, four bars, two dance floors, go-go-dancers and a darn good time for everyone. Avoid the lines by getting your tickets in advance. 10. My True Colors Arts & Film Festival, New York City. Thirty-five plays, theater performances, narratives and documentaries tell the stories of LGBT lives and experiences. The festival takes place at Harlem’s Faison Firehouse Theater. 11. Annual Pride Yacht Party, Minnesota. All aboard for dinner, cocktails and dance parties as the Majestic Star cruises the Saint Croix River. Complimentary photography and an open deck for “wind-in-your-hair selfies” make it easy to humble brag that you’re on a boat. 12. Rainbow Bowling, Colorado. If rainbow is how you roll, get together with friends and bowl. Two hours, two shoes and proceeds support pride events. What could be better? 13. Trans Women of Color Comedy Storytelling, Oakland. Nothing brings people together quite like a good chuckle. Come out to see comedy storytelling by trans women of color. Presented by the Peacock Rebellion & Qcc, who sold-out their runs last year. Didn’t find the event for you? Discover all LGBT pride events. Tags: gay rights, LGBT, pride month. West Hollywood: Peter Mac Brings Garland Back For the Holidays! Good news West Hollywood! Judy is back, just for the holidays. Female impersonator Peter Mac is bringing his spot-on impersonation of everyone’s favorite diva to the stage for four nights this week in “The Judy Garland Christmas Special Live.” This show opens tomorrow night, Wednesday, December 14 and is an homage to one of the greatest performers of our time. In her brief 47 years, Judy Garland accomplished a lot. She was a celebrated singer, both on record and live, and was renowned for her contralto voice. She was an international celebrity for her roles in musical and dramatic performances on film and on stage, most notably as Dorothy in The Wizard of Oz. She received multiple Grammy Awards, a Special Tony Award, was nominated for the Academy award for Best Actress and Best Supporting Actress and was the youngest recipient, at 39, to recieve the Cecil B. DeMille Award for lifetime achievement in the motion picture industry. Tags: Cabaret Scenes, drag, Juday Garland, Katherine Hepburn, LGBT, Liza Minelli, Peggy Lee, Peter Mac, The Judy Garland Christmas Show.